To study a potential IL-12p40-dependent but IL-12p75-independent agonistic activity regulating the immune response against Salmonella Enteritidis, the course of infection in IL-12p35-deficient mice (IL-12p35−/−, capable of producing IL-12p40) was compared with that of IL-12p40−/− mice. Mice lacking IL-12p40 revealed a higher mortality rate and higher bacterial organ burden than mice capable of producing IL-12p40. This phenotype was found in both genetically susceptible (BALB/c, Itys) and resistant mice (129Sv/Ev, Ityr) indicating Ity-independent mechanisms. The more effective control of bacteria in the IL-12p35−/− mice was associated with elevated serum IFN-γ and TNF-α levels. In contrast, IL-12p40−/− mice showed reduced IFN-γ production, which was associated with significantly elevated serum IgE levels. Early during infection (days 3 and 4 postinfection), as well as late (day 20 postinfection), the number of infected phagocytes was strongly increased in the absence of IL-12p40 indicating impaired bactericidal activity when IL-12p40 was missing. Liver histopathology revealed a decreased number of mononuclear granulomas in IL-12p40−/− mice. Depletion of CD4+ or CD8+ T lymphocytes in vivo suggested that both T cell subpopulations contribute to the IL-12p40-dependent protective functions. Analysis of IL-12p40 vs IL-23p19 mRNA expression revealed an up-regulation of only IL-12p40 mRNA during Salmonella infection. Together these data indicate that IL-12p40 can induce protective mechanisms during both the innate and the adaptive type 1 immune response in Salmonella infection. This novel activity of IL-12p40 complements the well described dominant and essential role of IL-12p75 in protective immunity to Salmonella infection. The genus Salmonella is the causing agent of a variety of infections in humans, ranging from acute self-limiting gastroenteritis to systemic typhoid fever (1, 2, 3). In typhoid, Salmonella Typhi spread systemically to deeper tissues and visceral organs (2). Salmonella Typhimurium has proven to be a useful model for studying invasive typhoid-like disease, as some strains are able to cause systemic salmonellosis following oral infection in mice (1). Recently, we established an infection model based on i.p. infection with Salmonella Enteritidis, another serovar of Salmonella Enterica, which became recently more important for human disease. This pathogen induces a typhoid-like infection similar to that caused by S. Typhimurium in susceptible BALB/c mice (Itys), whereas mice with innately resistant background (e.g., 129Sv/Ev, Ityr) control low doses of virulent S. Enteritidis at the early stage of infection before T cell- or B cell-mediated immune mechanisms develop (Ref. 4 ; and J. Lehmann, unpublished data). IL-12 represents a heterodimeric protein consisting of two glycosylated subunits (35 and 40 kDa) that are linked covalently by a disulfide bond (5, 6). The p40 subunit is strongly induced in APCs by bacterial and viral Ags, whereas the p35 subunit is constitutively transcribed (7, 8). Within the endoplasmic reticulum, both subunits are joined together to form the bioactive IL-12p75 molecule (9). IL-12p75 has previously been shown to be the key factor for the induction of a Th1 immune response, which is essential to control infections with intracellular pathogens (10, 11, 12). Besides the heterodimeric molecule IL-12p75, the p40 subunit can also form homodimers (IL-12(p40)2). An excess of IL-12(p40)2 was found to act antagonistically to IL-12p75 in vitro and in vivo, because this molecule is able to compete with IL-12p75 for the IL-12Rβ1 binding site (13, 14, 15, 16). But unlike the IL-12p75, IL-12(p40)2 cannot bind to the IL-12Rβ2 subunit of the IL-12 receptor, which is responsible for signal transduction leading to STAT-4 activation (17). Recently, a new cytokine designated IL-23 was identified, which consists of the IL-12p40 subunit covalently linked to a newly discovered 19-kDa polypeptide chain (18). Like the IL-12(p40)2, this new molecule is also capable of binding only to IL-12Rβ1 but not IL-12Rβ2 (18). So far it is not known whether IL-23 can antagonize IL-12p75-induced effects. Interestingly, an IL-12p40-dependent activity was found to contribute to the protective immune response against the fungal pathogen Cryptococcus neoformans, a result that was previously published by our group (19). IL-12(p40)2 was also shown to act agonistically with IL-12 in a murine transplantation model via the activation of CD8+ T cells (20). Here we present for the first time data which show that an IL-12p40-dependent activity is able to contribute to protective immunity against S.Enteritidis independently of IL-12p75. Breeding pairs of BALB/c and 129Sv/Ev mice of three different genotypes (wild-type; IL-12p35−/−, Ref. 21 ; and IL-12p40−/− or IL-12p35/40−/−, Ref. 22) were provided by Dr. H. Mossmann (Max-Planck-Institute for Immunobiology, Freiburg, Germany). Mutant mice had been backcrossed five times on a BALB/c background (23) or were on a genetically pure 129Sv/Ev background. Animals were housed under specific pathogen-free conditions in filter-topped cages within a Maxi-Miser Caging system (Thoren Caging Systems, Hazleton, PA) containing sterile bedding. Mice were fed sterile food and water. For most experiments wild-type and mutant BALB/c mice were used unless otherwise stated. 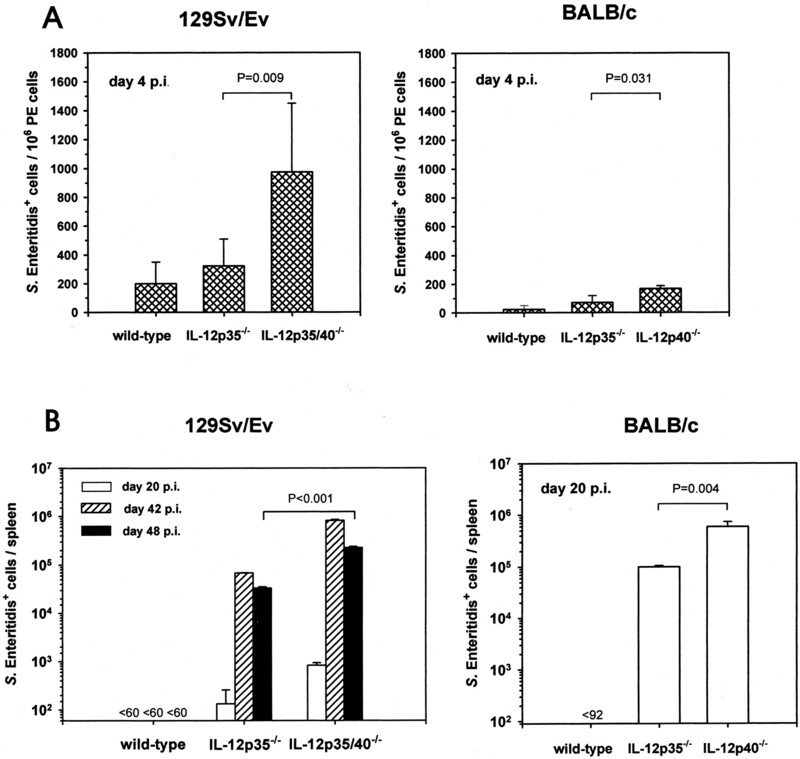 To study the role of the Ity gene Itys BALB/c mice were compared with Ityr 129Sv/Ev mice. Animals were used at 8–12 wk of age. Mice were infected with an attenuated vaccination strain of S. enterica serovar Enteritidis (S. Enteritidis; ade−, his−; SALMOVAC SE; Impfstoffwerk Dessau-Tornau, Rosslau, Germany) (4, 24) and, in indicated cases, challenged with one of two different virulent wild-type strains of S. Enteritidis (147 Nalr, high virulent or 64/03 Nalr, low virulent; provided by Dr. S. Springer, Impfstoffwerk Dessau-Tornau). The animals (3–8/group) were inoculated i.p. with different doses (5 × 101 to 1 × 107 CFU) (4, 25). Different standard inocula were used to study the early (1 × 106 CFU) or the late (2.5 × 103 CFU) infection stage in both BALB/c and 129Sv/Ev background. Using an inoculum of 2.5 × 103 CFU in IL-12p40-deficient mice clinical symptoms occurred starting with day 16 postinfection (p.i. )4 on the BALB/c or with day 42 p.i. in the 129Sv/Ev mice. If not otherwise stated, wild-type and mutant mice on the BALB/c background were used in the experiments described. Heat-killed S. enteritidis (hk S.E.) were prepared by incubating bacteria at 60°C for 60 min in a water bath. Killed salmonellae were stored at 1 × 1010/ml in PBS at −75°C. This preparation was used as Ag for ex vivo stimulation of splenocytes. After different time points (2, 3, 4, 20, 42, or 48 days p.i. ), three to six mice per group were sacrificed. The thorax and the peritoneum of the animals were opened under sterile conditions, and they were bled by cardiac puncture, followed by the isolation of spleen and liver. After the determination of the spleen and liver weights, both organs were homogenized. Then the spleen and liver homogenates were diluted 1/3 or 1/10 (w/v), respectively, in PBS. Log10 serial dilutions of the homogenates in PBS were plated onto selective Xylose-Lysine-Desoxicholate agar (Merck, Darmstadt, Germany). Colonies were counted after 24- and 48-h incubation periods at 37°C. In cases in which only a part of the organ was homogenized, counts were corrected for the whole organ weights. To evaluate the number of peritoneal or splenic phagocytes that were positive for viable intracellular salmonellae, cells were freshly isolated from the peritoneal cavity by lavage with 5 ml of ice-cold PBS or from the spleen by passage through a 100-μm mesh cell strainer (Falcon; BD Biosciences, Heidelberg, Germany). Before plating, cells were washed three times in PBS, then incubated for 1 h in RPMI 1640 containing 100 μg/ml gentamicin (Life Technologies, Karlsruhe, Germany) to completely eliminate extracellular bacteria. After two additional washing steps in PBS, the cell number was adjusted to 1 × 105/ml or 1 × 106/ml, and 1 ml of the peritoneal cell or splenocyte suspension was plated onto Xylose-Lysine-Desoxicholate agar (Merck) and air-dried under sterile conditions. The density of the plated cells was checked microscopically to verify that single nonconfluent bacterial colonies could develop from the seeded cells. Growing colonies were counted after 24- and 48-h incubation periods at 37°C. Each single colony represented one Salmonella-positive phagocyte. Intracellular Salmonella Ag (comprising viable and killed/processed intracellular salmonellae) was indirectly fluorochrome-stained using a polyclonal rabbit anti-S. Enteritidis antiserum as primary Ab and a FITC-labeled goat anti-rabbit Ig (Jackson Immunoresearch Laboratories, West Grove, PA) as secondary Ab. The antiserum was obtained after s.c. immunization, and two intramuscular booster applications of an Ag suspension containing heat-killed and freeze-thawed S. enteritidis bacteria combined with Al(OH)3 (Eurobio, Raunheim, Germany). Phagocytes were identified by staining with the PE-labeled anti-CD11b mAb M1/70.15 (Caltag Laboratories, Hamburg, Germany) simultaneously to the secondary staining of the Salmonella Ag. Total IgE serum levels were measured with a sandwich ELISA according to a standard protocol by using mAbs and a murine IgE standard from BD PharMingen (Heidelberg, Germany). Briefly, 96-well microtiter plates (Maxisorp; Nunc, Roskilde, Denmark) were coated overnight at 4°C with the anti-IgE mAb R35-118 in 0.1 M carbonate buffer (pH 9.6). Plates were blocked and incubated with the 1/5 diluted serum samples and the mouse IgE standard. Then plate-bound IgE was detected by incubation with the biotinylated anti-IgE mAb R35-72 for 1 h followed by a 30-min incubation at room temperature with streptavidin-peroxidase (Southern Biotechnology Associates, Birmingham, AL) and the ABTS substrate reaction (Sigma, Deisenhofen, Germany). The detection limit was 8 ng/ml. For the detection of Ag-specific IgE microtiter plates (Polysorp; Nunc) were coated overnight at 4°C with whole-cell extracts prepared by repeated freeze-thaw cycles of a fresh bulk culture of S. Enteritidis. Plates were blocked and then incubated with undiluted and 1/5 diluted mouse sera for 2 h at room temperature, followed by detection of Ag-bound specific IgE serum Abs using the biotinylated anti-IgE mAb R35-72 and streptavidin-peroxidase as described above. Single cell suspensions of the spleens were prepared by mincing and passing the tissue through a 100-μm mesh cell strainer (Falcon). The erythrocytes were lysed by using ammonium chloride buffer (0.15 M NH4Cl, 0.1 mM EDTA disodium salt dihydrate, 10 mM NaHCO3; Merck). The splenocytes were washed three times in cold PBS and resuspended in RPMI 1640 culture medium (Life Technologies) supplemented with 10% heat-inactivated FCS, 2 mM L-glutamine (Biochrom, Berlin, Germany), 10 mM HEPES buffer, 100 U/ml penicillin, 100 μg/ml streptomycin, and 50 μM 2-ME (Sigma). Following adjustment of the cell number to 5 × 106/ml, 1 ml of splenocyte suspension was dispensed into 24-well plates and stimulated with either mitogen (5 μg/ml Con A; Sigma) or Ag (106-108 hk S.E.) or left unstimulated. After 48 h of culture at 37°C in a humidified atmosphere containing 5% CO2, cell-free culture supernatants were harvested and stored in aliquots at −75°C until cytokine measurements. Cytokines (IFN-γ, IL-12p40, TNF-α, IL-4, IL-6, IL-10) in sera and cell culture supernatants were measured by sandwich ELISA according to standard protocols by using matching pairs of mAbs. Briefly, IFN-γ was assessed by using the mAb AN-18 (5 μg/ml; American Type Culture Collection (ATCC), Manassas, VA) as capture and the peroxidase-conjugated mAb XMG1.2 (ATCC) as detection Ab (both mAbs were provided by Dr. H. Gallati, Hoffmann-LaRoche, Basel, Switzerland), with recombinant mouse IFN-γ (provided by Dr. G. R. Adolf, Ernst Boehringer Institute, Vienna, Austria) as the standard (detection limit: 16 pg/ml). IL-12p40 was measured by using the mAb 5C3 (5 μg/ml; ATCC) as capture and biotinylated polyclonal goat anti-mouse IL-12 as detection Ab (both Abs were provided by Dr. H. Gallati, F. Hoffmann-LaRoche) combined with streptavidin-peroxidase (Southern Biotechnology Associates), with recombinant mouse IL-12 (provided by Dr. M. Gately, Hoffmann-LaRoche, Nutley, NJ) as the standard (detection limit: 156 pg/ml). IL-6 was measured using the mAb MP5-20F3 (5 μg/ml) as capture and the biotinylated mAb MP5-32C11 (5 μg/ml) as detection Ab (both obtained from BD PharMingen) combined with streptavidin-peroxidase (Southern Biotechnology Associates), with recombinant mouse IL-6 (BD PharMingen) as standard (detection limit: 32 pg/ml). IL-4, IL-10, and TNF-α were measured by using the respective DuoSet ELISA development systems (R&D Systems, Wiesbaden, Germany) following the manufacturers instructions. In indicated experiments IL-12p40 was neutralized in IL-12p35−/− mice by i.p. injection of 100 μg of anti-mouse IL-12p40 mAb 10F6 (ATCC, provided by Dr. H. Gallati) per mouse at days −1 and 1 p.i. 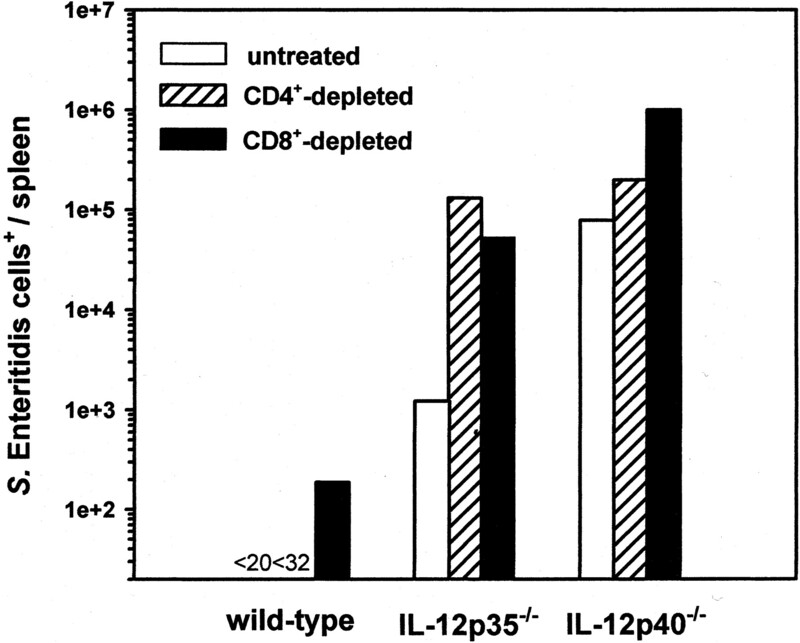 To deplete CD4+ or CD8+ T cells, groups of five animals of each genotype (wild-type, IL-12p35−/−, IL-12p40−/−) were treated with anti-mouse CD4 (anti-L3T4, clone GK 1.5, rat IgG2b; a gift from Dr. S. Ehlers, Research Center Borstel, Borstel, Germany) or with anti-mouse CD8 (anti-Lyt2.2, clone 2.43, rat IgG2b; a gift from Dr. S. Ehlers; in combination with anti-Lyt2.1/Lyt2.2, clone 53-6.7, rat IgG2a; BD PharMingen). Both CD4 and CD8 Abs were administered i.p. at total doses of 0.5 mg/mouse on three consecutive days (days −6, −5, and −4). Six days after the first mAb injection the degree of depletion (reaching 99.9% for CD4+ and 99.6% for CD8+) was analyzed by FACS analysis (26). Then the depleted animals were infected with 2.5 × 103 CFU S. enteritidis. Spleen and liver tissue samples from sacrificed mice were immediately fixed in 5% phosphate-buffered formalin and embedded in paraffin. Tissue sections (5 μm) were stained with H&E and analyzed for the tissue granulomatous response using light microscopy. Randomly selected (n = 8) high power fields of tissue sections from both organs were examined from each animal. Total RNA was extracted from 10 mg of homogenized mouse spleen using the RNeasy minikit (Qiagen, Hilden, Germany) according to the manufacturer’s instructions combined with a DNA digestion step (DNase, Roche Diagnostics, Mannheim, Germany). Reverse transcription was performed with 500 ng of total RNA, peqGOLD dNTP-Mix (Peqlab, Erlangen, Germany), oligo(dT) primer, and Expand Reverse Transcriptase (both obtained from Roche Diagnostics) according to the manufacturer’s instructions using a conventional thermocycler (GeneAmp PCR System 2400; Applied Biosystems, Weiterstadt, Germany) in a total volume of 20 μl. For relative quantification of IL-12p40 and IL-23p19 mRNA, 5 μl of each sample cDNA was used for real-time PCR, which was conducted on the LightCycler Instrument (Roche Diagnostics). The amplification of cDNA was monitored with the fluorescent DNA binding dye SYBR Green using the LightCycler-FastStart DNA Master SYBR Green I kit (Roche Diagnostics), according to the manufacturer’s instructions. Specific primers were designed using Primer Express software (Applied Biosystems). The following primer pairs were used for β-actin (forward primer, 5′-AGA GGG AAA TCG TGC GTG AC-3′; reverse primer, 5′-CAA TAG TGA TGA CCT GGC CGT-3′; product size 148 bp), IL-12p40 (forward primer, 5′-GGA AGC ACG GCA GCA GAA TA-3′; reverse primer, 5′-AAC TTG AGG GAG AAG TAG GAA TGG-3′; product size 180 bp), IL-23p19 (forward primer, 5′-TGC TGG ATT GCA GAG CAG TAA-3′; reverse primer, 5′-GCA TGC AGA GAT TCC GAG AGA-3′; product size 121 bp). The cytokine mRNA levels of infected animals were relatively quantitated in comparison to the respective level of naive animals by using the comparative CT (threshold cycle) method (27). Briefly, the amount of target, normalized to an endogenous reference (β-actin) and relative to a calibrator (cytokine mRNA expression in naive animals), is given by: 2−ΔΔCT, where ΔCT = CT,X − CT,R is the difference in threshold cycles for target and reference and ΔΔCT = ΔCT,q − ΔCT,cb is the difference in the threshold cycles for any sample q and the calibrator cb. Before using the ΔΔCT method for relative quantitation, a validation experiment was performed to demonstrate that efficiencies of target amplification and reference amplification are approximately equal. For validation of IL-12p40 and IL-23p19 mRNA expression total cDNAs prepared from murine primary bone marrow macrophages stimulated with IFN-γ (100 U/ml) + LPS (100 ng/ml) or RAW264.7 macrophages (ATCC) stimulated with hk S.E. (107/ml) were used as model systems to generate standard curves for IL-12p40 or IL-23p19, respectively. The crossing point for each reaction was determined using the Second Derivative Maximum algorithm and the arithmetic baseline adjustment using LightCycler software (Roche Diagnostics). Statistical analyses were performed with the Mann-Whitney rank sum test or Student’s t test if the samples passed the normality and the equal variance analyses by using SigmaStat for Windows software (Jandel, Erkrath, Germany). To characterize the course of S. Enteritidis infection in mice in the absence of either IL-12p75 or IL-12p40, the survival rates as well as the survival times of IL-12p35−/−, IL-12p40−/−, and wild-type mice were determined. Wild-type mice that were able to produce IL-12p75 as well as IL-12p40 survived inocula of up to 107 CFU of S. Enteritidis (LD50 = 3 × 107) and showed clinical symptoms following inoculation with ≥106 CFU. In contrast, both IL-12p35- and IL-12p40-deficient mice were more sensitive to Salmonella infection. Mice of both strains died when infected with ≥5 × 103 CFU. However, at doses lower than 5 × 103 CFU the survival rates and the survival times differed between IL-12p35- and IL-12p40-deficient mice in a dose-dependent fashion (Fig. 1⇓). At an inoculum of 50 CFU IL-12p35−/− mice completely survived up to day 50 p.i., whereas 50% of the IL-12p40−/− mice died starting at day 18 p.i. These data indicate that IL-12p40 contributes to the control of S. Enteritidis infection at relatively low infection doses. Following i.p. infection with live attenuated S. Enteritidis bacteria IL-12p35−/− mice showed higher survival rates or longer survival times than IL-12p40−/− mice depending on the infection dose. 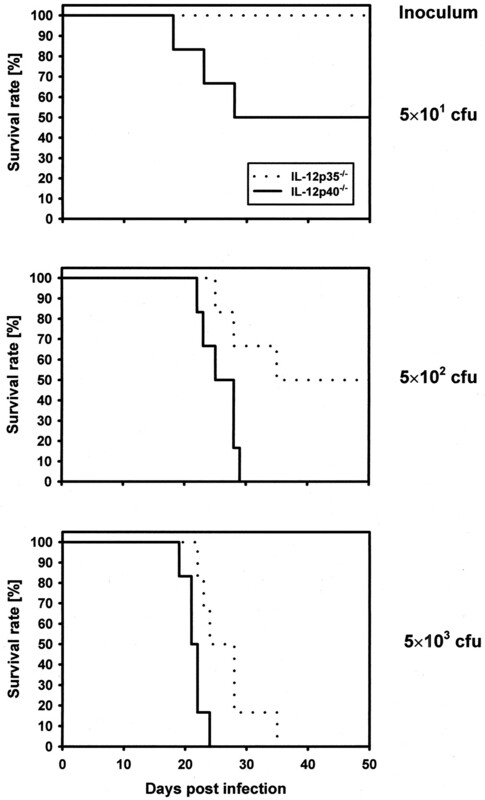 At the lowest inoculum of 5 × 101 CFU (top) all IL-12p35−/− stayed alive, whereas 50% of the IL-12p40−/− mice died of the infection (n = 6). At a 10-fold higher inoculum of 5 × 102 CFU (middle) only 50% of the IL-12p35−/− but none of the IL-12p40−/− survived (n = 6), and at a 100-fold higher inoculum of 5 × 103 CFU (bottom), neither IL-12p40−/− nor IL-12p35−/− mice survived the infection (n = 6). However, at this infection dose the mean survival time of IL-12p35−/− mice was significantly higher than that of IL-12p40−/− mice (26.7 vs 21.5 days, p = 0.032; Student’s t test). IL-12p35−/−, IL-12p40−/−, and wild-type mice were infected with S. Enteritidis and analyzed for the bacterial load in the major visceral target organs spleen and liver. Different bacterial inocula were used to study the early stage of infection on days 3 and 4 p.i. (1 × 106 CFU) or the late stage of infection on day 20 p.i. (2.5 × 103 CFU). Interestingly, in both the early (Fig. 2⇓A) and the late phase of the infection (Fig. 2⇓B) the recovered bacterial numbers from the spleen or liver were significantly lower in IL-12p35−/− than in IL-12p40−/− mice. These data indicate an agonistic role of IL-12p40 in innate immunity and also in adaptive immunity. 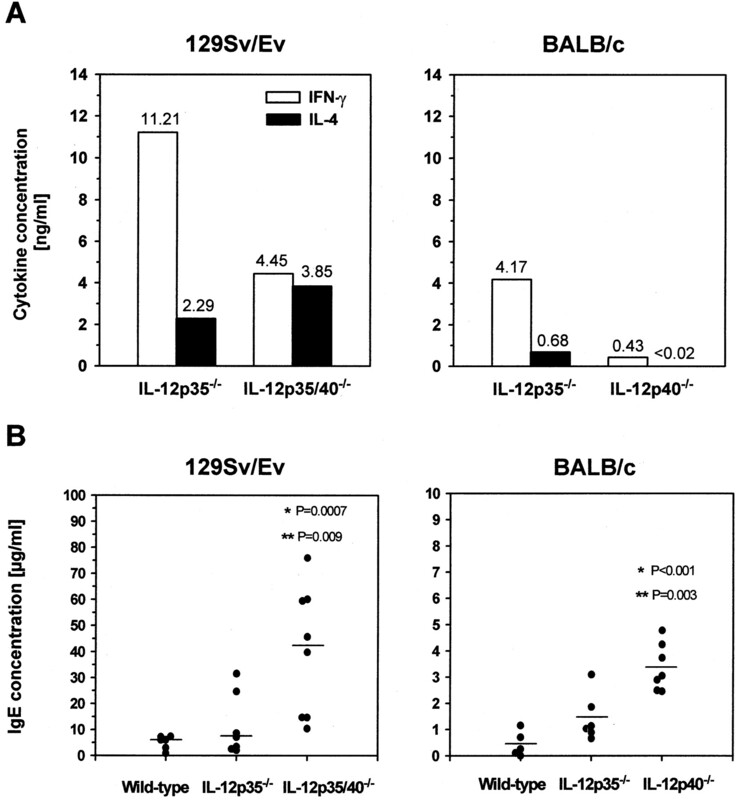 Similar results were obtained for Itys BALB/c and Ityr 129Sv/Ev mice indicating Nramp1 (Ity)-independent agonistic activity of IL-12p40. Following inoculation with 2.5 × 103 CFU salmonellae were detectable at only low levels in wild-type mice of both genetic backgrounds at day 20 p.i. Bacterial numbers in spleen or liver of S. Enteritidis-infected mice at day 3, 4, or 20 p.i. A, Following inoculation with 1 × 106 CFU the log10 values of the salmonellae CFU derived from the spleen at days 3 and 4 p.i. were significantly higher in IL-12p40-deficient compared with IL-12p35-deficient mice (∗, Significantly elevated compared with the respective mean log10 CFU value of the IL-12p35−/− group). B, Following inoculation with 2.5 × 103 CFU the log10 values of the salmonellae CFU derived from spleen (left) and liver (right) at day 20 p.i. were significantly higher in IL-12p40−/− than wild-type (∗) or IL-12p35−/− mice (∗∗). The CFU levels of IL-12p35−/− mice were also significantly higher compared with wild-type mice (∗). The values represent single mice derived from one of four independent experiments with similar results. The mean values are indicated (—), statistical significances were assessed using Student‘s t test. Two days p.i., higher levels of IFN-γ and TNF-α were detectable in the sera from IL-12p35−/− mice compared with those from IL-12p40−/− mice or from IL-12p35−/− mice that were treated with the neutralizing anti-IL-12p40 mAb 10F6 (Fig. 3⇓). This pattern of IFN-γ and TNF-α production was accompanied by serum IL-12p40 in S.Enteritidis-infected IL-12p35-deficient mice at similar levels as in infected wild-type mice (Fig. 3⇓). None of the three cytokines was detectable in naive mice of either genotype (data not shown). Serum IFN-γ (upper) and TNF-α levels (middle) are significantly decreased in S.Enteritidis-infected IL-12p40-deficient mice at day 2 p.i. As shown in the lower graph IL-12p40 was induced in vivo by S. Enteritidis infection in wild-type as well as in IL-12p35-deficient mice. The mice were inoculated with 1 × 107 CFU S. Enteritidis, and the sera were taken at day 2 p.i. To verify the specific importance of IL-12p40 during S. Enteritidis infection in mice with a functional p40 gene, IL-12p40 was neutralized in IL-12p35−/− mice by i.p. injection of the anti-IL-12p40 mAb 10F6 (100 μg/application at days −1 and 1 p.i.). The values represent single mice. The mean or median values are indicated (—), statistical significances were assessed using Student‘s t test or the Mann-Whitney rank sum test, respectively (∗ vs IL-12p35−/−+anti-IL-12p40; ∗∗ vs IL-12p40−/−). None of the three cytokines was detectable in naive animals of either genotype (data not shown). To study the underlying IL-12p40-dependent protective mechanism(s) in S. Enteritidis-infected wild-type, IL-12p35-, and IL-12p40-deficient mice, the bactericidal capacity of splenic phagocytes was determined by plating and subsequently counting Salmonella-positive splenocytes. Using this assay it was possible to detect single intracellularly infected phagocytes. As shown in Fig. 4⇓ the number of S. Enteritidis-infected phagocytes was significantly elevated in IL-12p40−/− compared with IL-12p35−/− mice as early as day 4 p.i. in the peritoneal cavity (Fig. 4⇓A) as well as later on (i.e., days 20, 42, and 48 p.i.) in the spleen (Fig. 4⇓B). The number of S. Enteritidis+ peritoneal (A) or splenic cells (B) was strongly elevated in IL-12p40-deficient 129Sv/Ev mice (Ityr, left panel) and BALB/c (Itys, right panel). BALB/c and 129Sv/Ev mice were infected i.p. with 1 × 106 CFU S. Enteritidis for analysis of early innate immune mechanisms (day 4 p.i.) or with 2.5 × 103 CFU S. Enteritidis for analysis of later infection stages (day 20 p.i. for BALB/c mice or days 20, 42, and 48 p.i. for 129Sv/Ev mice). The panels show the number of infected phagocytes. At indicated time points the cells were isolated from the peritoneum or the spleen as described in Materials and Methods. The results are expressed as the means ± SD of three individual mice per group of one representative of four experiments. Interestingly, the frequency of infected phagocytes was elevated in BALB/c, and even more pronounced in 129Sv/Ev mice, indicating that the IL-12p40-dependent effect on the phagocyte bactericidal capacity was independent of the Nramp1(Ity) genotype. Wild-type mice of both genetic backgrounds had lower amounts of Salmonella-positive peritoneal cells than IL-12p35−/− mice between days 1 and 4 p.i. (these differences were not statistically significant; Fig. 4⇑A). At the later time points (i.e., days 20, 42, and 48 p.i.) viable Salmonella-positive cells were no more detectable in the spleens from wild-type mice, at detection limits of 92 and 60 cells/spleen (Fig. 4⇑B). The data obtained for viable Salmonella-positive splenic phagocytes were confirmed by intracellular staining of Salmonella Ag in splenic macrophages derived from wild-type, IL-12p35−/−, and IL-12p40−/− mice (day 20 p.i.) and analysis by flow cytometry. In IL-12p40−/− mice the percentages of S. Enteritidis Ag-positive macrophages were 3.6-fold higher than in wild-type mice, and 3.5-fold higher than in IL-12p35−/− mice. In addition, the total number of Ag-positive splenic macrophages was 1.9-fold higher compared with wild-type mice, and 2.4-fold higher compared with IL-12p35−/− mice; this shows that the total cell number was lower in wild-type than in IL-12p35−/− mice (Fig. 5⇓). These data indicate a correlation between the high levels of intracellular Ag and the number of live intracellular salmonellae shown in Fig. 4⇑ in IL-12p40-deficient mice. Interestingly, this analysis demonstrated also the presence of residual Salmonella Ag in wild-type splenic macrophages at a time point where no viable bacteria could be found anymore in wild-type mice. 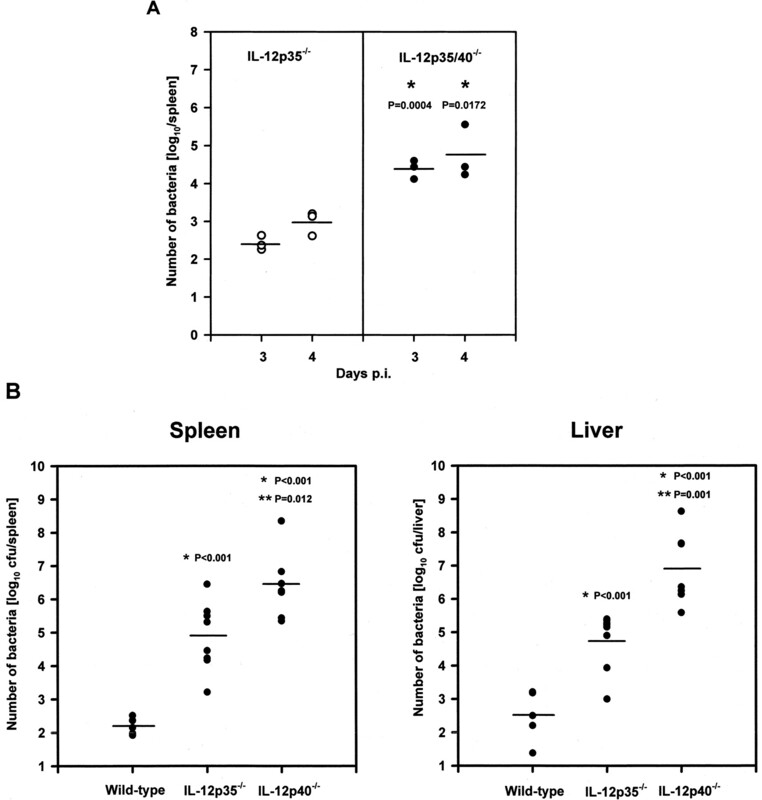 The percentage (a) and the total number (b) of Salmonella Ag+ splenic phagocytes were higher in IL-12p40−/− (right panel) than in IL-12p35−/− (middle panel) or wild-type mice (left panel). Mice of the three indicated genotypes were infected with 2.5 × 103 salmonellae. At day 20 p.i. the animals were sacrificed, and single splenocyte suspensions were prepared as described in Materials and Methods. The cells were fixed in ice-cold 4% phosphate-buffered paraformaldehyde for 10 min, permeabilized with 0.1% saponin, and simultaneously stained for the myeloid activation marker CD11b (anti-CD11b-PE), which stains a subunit of the αMβ2 integrin CR3 (expressed predominantly on phagocytes) and intracellular S. Enteritidis Ag using a rabbit anti-S. Enteritidis antiserum combined with goat anti-rabbit Ig F(ab)2-FITC as secondary Ab. Salmonella Ag+/CD11b+ cells were detected using flow cytometry. The percentages of S. Enteritidis Ag+ phagocytes (a) were 3.6- or 3.5-fold higher, and the total numbers of Ag+ phagocytes (b) were 1.9- or 2.4-fold higher in IL-12p40−/− than in IL-12p35−/− or wild-type mice, respectively. To differentiate the immune responses induced by S.Enteritidis in wild-type, IL-12p35-, and IL-12p40-deficient mice into Th1- or Th2-biased responses, IFN-γ and TNF-α vs IL-4 levels in mitogen- or Ag-induced splenocyte culture supernatants, and serum IgE levels from S. Enteritidis-infected animals were analyzed after 20 (BALB/c) or 48 (129Sv/Ev) days of infection. As mentioned in Materials and Methods the symptomatic stages of the S. Enteritidis infection occurred between days 16 and 20 p.i. in BALB/c mice and between days 42 and 48 p.i. in 129Sv/Ev mice when infected with 2.5 × 103 CFU. Therefore, we analyzed T cell responses at day 20 p.i. in BALB/c and day 48 p.i. in 129Sv/Ev mice. As shown in Fig. 6⇓A, the mitogen-induced IFN-γ concentrations in splenic culture supernatants from IL-12p35−/− 129Sv/Ev and from IL-12p35−/− BALB/c mice were 2.5- and 9.8-fold higher than from IL-12p40-deficient mice, respectively. Similar data were obtained for Ag-induced IFN-γ (data not shown). In IL-12p40-deficient 129Sv/Ev mice, lower IFN-γ amounts corresponded with elevated IL-4 amounts. However, IL-4 was almost undetectable in culture supernatants derived from IL-12p40-deficient BALB/c splenocytes. Moreover, the total IgE serum level was significantly elevated in both IL-12p40-deficient 129Sv/Ev and even in BALB/c mice where no IL-4 was detectable ex vivo compared with wild-type or IL-12p35-deficient mice (Fig. 6⇓B). The pattern of the total IgE response corresponded to that of Salmonella Ag-specific IgE in the different genotypes (data not shown). Together these data indicate a residual type 1 immune response (in the absence of IL-12p75) that depends on IL-12p40, whereas in the absence of IL-12p40 a stronger type 2 response develops. Th2 bias of the immune response against S. Enteritidis in IL-12p40−/− mice independently of the Ity genotype. Due to strain-specific differences in the appearance of clinical symptoms, infected BALB/c mice were analyzed at day 20 p.i. whereas infected 129Sv/Ev mice were analyzed at day 48 p.i. (inoculum 2.5 × 103 CFU). A, Splenocytes were isolated at day 20 or 48 p.i. from BALB/c or 129Sv/Ev mice, respectively, and stimulated with 5 μg/ml Con A for 48 h. The culture supernatants were assessed for IFN-γ and IL-4 by ELISA. The indicated values represent the mean cytokine concentration in the supernatant of pooled spleen cells derived from four mice per group. B, Sera were taken at day 20 or 48 p.i. from BALB/c or 129Sv/Ev mice, respectively, and assessed for total IgE by ELISA. The values represent single mice derived from two independent experiments. The mean values are indicated (—), statistical significances were assessed using Student‘s t test (∗ IL-12p35/40−/−/IL-12p40−/− vs wild-type; ∗∗ IL-12p35/40−/−/IL-12p40−/− vs IL-12p35). Because our data not only indicated early innate immunity defects in the absence of IL-12p40 but also later potentially T cell-dependent defects, we were interested in evaluating the impact of CD4+ or CD8+ T cells as potential targets for IL-12p40 in S. Enteritidis infection. Both T cell subpopulations were alternatively depleted in vivo. In IL-12p35−/− mice the depletion of both CD4+ and CD8+ T cells resulted in 107- and 43-fold higher numbers of infected splenic phagocytes, respectively (Fig. 7⇓), and significantly elevated bacterial numbers in the liver (mean ± SD log10 CFU control: 4.503 ± 1.017; mean ± SD log10 CFU CD4-depletion: 6.049 ± 1.082 p = 0.048; mean ± SD log10 CFU CD8 depletion: 6.319 ± 0.742 p = 0.012). This indicates that the p40-dependent bactericidal activity involves both T cell subpopulations. In contrast, in wild-type mice only the depletion of CD8+ cells led to an increase (9.4-fold) of infected splenic phagocytes (Fig. 7⇓) and significantly increased bacterial burden in liver (mean ± SD log10 CFU control: 2.496 ± 0.760; mean ± SD log10 CFU CD8 depletion: 3.862 ± 0.344, p = 0.006) and spleen (mean ± SD log10 CFU control: 2.188 ± 0.252; mean ± SD log10 CFU CD8 depletion: 2.892 ± 0.408, p = 0.011). Therefore, in wild-type mice with a functional IL-12 system CD8+ T cells appear to be a central effector population. This is somewhat more pronounced than reported by other authors who observed only a marginal contribution of CD8+ T cells to immunity against Salmonella (28, 29), and may depend on the time point for the analysis of the Salmonella infection and/or the use of different Salmonella strains and/or the infection route. The bactericidal capacity of splenic phagocytes is reduced by both the depletion of CD4+ as well as CD8+ cells in IL-12p35−/− mice but to a lower degree only by depletion of CD8+ cells in wild-type mice. 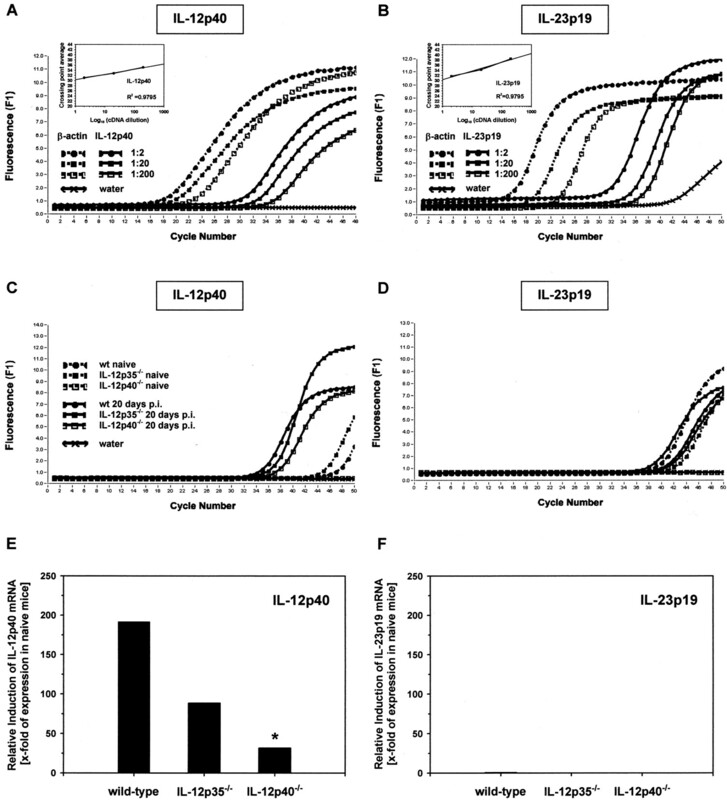 Mice were depleted of CD4+ or CD8+ cells by three administrations of 0.5 mg/application of anti-L3/T4 (clone GK 1.5) or anti-Lyt2.1/2.2 (clones 2.43 + 53-6.7) mAbs and then i.p. infected at day 6 after the first mAb injection with 2.5 × 103 CFU S. Enteritidis. The number of infected splenic phagocytes was analyzed at day 20 p.i. as described in Materials and Methods. The results represent the mean value of pooled spleen cells derived from five mice per group. Although in IL-12p40−/− mice the rates of viable S. Enteritidis-positive splenic phagocytes were also slightly elevated after either CD4+ depletion (2.5-fold) or CD8+ depletion (12.7-fold), the total organ burden was not significantly affected by depletion of CD4+ or CD8+ cells (data not shown). Semiquantitative histopathological examination revealed an early onset of mononuclear granuloma formation in the presence of IL-12p40 (day 4 p.i.) (Table I⇓). At day 20 p.i. the histopathological response in liver and spleen of IL-12p40−/− mice was characterized by reduced numbers of mononuclear granulomas but a higher number of mixed cell granulomas, consisting predominantly of neutrophils compared with IL-12p35−/− mice (Table I⇓). Characteristically, the mononuclear liver granulomas were much less condensed in IL-12p35−/− than in IL-12p40−/− mice, which points to the beginning disintegration of granulomas in the absence of IL-12p40 (Fig. 8⇓, middle and lower panels). Moreover, large nondemarcated necroses were only detectable in IL-12p40−/− mice. The liver tissue response in wild-type mice was similar at days 4 and 20 p.i. showing only very few small mononuclear granulomas that were obviously sufficient to control the infection (Table I⇓, and Fig. 8⇓, upper panel). Histopathological examination of formalin-fixed paraffin-embedded and H&E-stained liver tissue sections at day 20 p.i. Top panel, Liver from wild-type mice contained very few and small-sized mononuclear granulomas; middle panel, liver from IL-12p35−/− mice showed a large number of weakly condensed mononuclear granulomas of variable size; bottom panel, liver sections from IL-12p40−/− mice showed an intermediate number of highly condensed mononuclear granulomas of variable size. Histopathological examination of the livers from CD4+- or CD8+-depleted animals revealed an increase of mononuclear as well as mixed cell granulomas and also demarcated and nondemarcated necroses in IL-12p35−/− mice (data not shown). Particularly, CD8+ depletion but not CD4+ depletion in IL-12p35−/− mice resulted in more condensed granulomas (Fig. 9⇓) comparable to those seen in IL-12p40−/− mice (Fig. 8⇑). Role of CD4+ and CD8+ cells in granuloma formation in IL-12p35−/− mice following infection with S. Enteritidis for 20 days. The histopathological examination of formalin-fixed, paraffin-embedded, and H&E-stained liver tissue sections at day 20 p.i. revealed a significant increase of weakly condensed medium- to large-sized mixed cell granulomas in CD4+-depleted (top panel) and of highly condensed medium- to large-sized mixed cell granulomas in CD8+-depleted IL-12p35−/− mice (bottom panel). Together, these data indicate a marked influence of both CD4+ and CD8+ T cells on the bactericidal activity of phagocytes, on total bacterial burden, and on the tissue granuloma response in IL-12p35−/− mice suggesting that both T cell subpopulations represent targets for IL-12p40 in a direct and/or indirect manner. Because the agonistic IL-12p40-dependent activities described above leave open whether homodimeric IL-12p40 (as shown in a murine transplantation model, Ref. 20) and/or the newly discovered p40-p19 heterodimer designated IL-23 (18) are responsible for protection we wished to clarify the contribution of IL-12p40 and/or IL-23. Therefore, real-time PCR was performed to quantitate the up-regulation of IL-12p40 and IL-23p19 mRNA in spleen from S. Enteritidis-infected mice at day 20 p.i. in comparison to naive control mice (Fig. 10⇓). This analysis revealed that only the IL-12p40 but not IL-23p19 message was induced in the spleens of S.Enteritidis-infected BALB/c mice. The IL-12p40 mRNA level was increased 192-fold in wild-type mice and 89-fold in IL-12p35−/− mice (Fig. 10⇓, C–F). There was also a slight increase of IL-12p40 mRNA in IL-12p40−/− mice, which results from a technical problem in construction of the knockout strain (22). As explained by Magram et al. (22) the inactivation of the IL-12p40 gene was mediated by the replacement of exon 3 with a neo cassette. Later it was shown that a transcript resulted from removal of the mutated exon 3 by a precise splice. That transcript encodes a mutated p40 protein (with a deletion of 89 amino acids) that was shown to be immunoreactive but biologically inactive (22). The primers used by us for real-time RT-PCR hybridized in that region. Expression of p35 mRNA was found in infected wild-type and IL-12p40−/− mice but not in IL-12p35−/− mice as one would expect (data not shown). Together with the induction of IL-12p40 mRNA, this suggests a physiological role of IL-12p75 and potentially of homodimeric IL-12p40 but not of IL-23. Real-time RT-PCR analysis of IL-12p40 or IL-23p19 mRNA expression by splenocytes from S. Enteritidis-infected BALB/c mice at day 20 p.i. demonstrated that S. Enteritidis infection caused only induction of IL-12p40 (C and E) but not of IL-23p19 (D and F) mRNA in wild-type and IL-12p35−/− mice. In IL-12p40−/− mice IL-23p19 mRNA was not expressed (D and F) but an IL-12p40 transcript was amplified (C and E ∗) which, based on the p40 knockout construction, represented the precisely spliced mRNA without the transcript from exon 3. This mRNA does not encode biologically active IL-12p40 (22 ). Amplification plots for either IL-12p40 and β-actin (A) or IL-23p19 and β-actin (B) show the increase in SYBR Green fluorescence for each cDNA sample (shown is one of duplicate amplifications per sample). The cDNAs for IL-12p40 or IL-23p19 amplification were derived from IFN-γ+LPS-stimulated primary bone marrow macrophages or from the macrophage cell line RAW264.7 (ATCC), respectively. Threshold cycle (CT) values for each sample were calculated from the linear part of the amplification plots by the second derivative maximum algorithm and the arithmetic baseline adjustment using LightCycler software. IL-12p40 or IL-23p19 CT values were normalized against β-actin, and normalized values of S. Enteritidis-infected mice were compared with those of naive animals of the respective genotype using the comparative ΔΔCT method (see Materials and Methods). Data are from one of three experiments with similar results. The dominant and essential role of IL-12p75 for protective immunity to Salmonella infection has been unambiguously demonstrated in murine Salmonella infection models (30, 31). In this report we demonstrate a less potent but nevertheless significant IL-12p40-dependent immunostimulatory activity that is independent of IL-12p75. Using i.p. infection of mice lacking the IL-12p35 or the IL-12p40 gene with an attenuated strain of S. Enteritidis to study potential agonistic IL-12p40-dependent effects in the absence of IL-12p75, we obtained the following major findings: In mice lacking the IL-12p40 gene 1) the survival rates and the survival times were reduced and the visceral bacterial burden was elevated, 2) the cytotoxic capacity of phagocytes was impaired at early and late time points during infection, 3) the Salmonella-induced immune response was Th2-biased, and 4) the granulomatous lesions contained a higher proportion of neutrophils. Following inoculation of bacterial doses between 104 and 107 CFU both IL-12p35−/− and IL-12p40−/− mice died completely within 8–20 days p.i. (data not shown). Such inocula are sublethal in wild-type mice and are capable of mediating adoptive immunity to challenge with wild-type S. enteritidis (strains 147Nalr, Ref. 4 ; or 64/03Nalr, J. Lehmann, unpublished results). 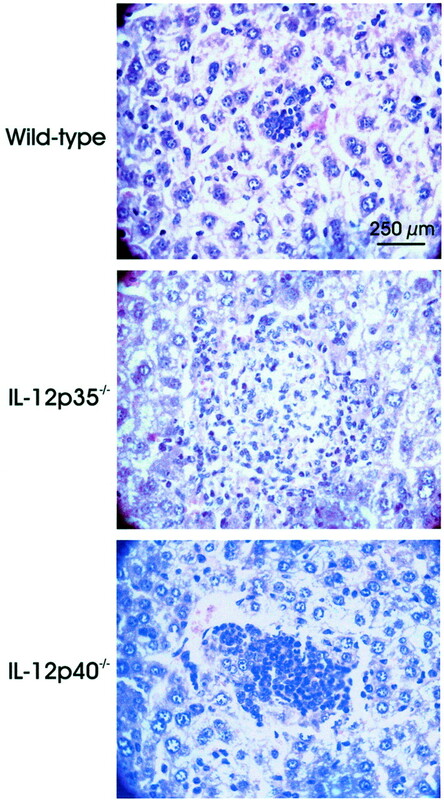 These data confirm previously reported results, which highlighted the importance of IL-12 in S. Typhimurium (30) and S. Dublin infection (31) in mice by neutralizing IL-12 in vivo using anti-murine IL-12 polyclonal antibodies or mAbs, respectively. It has to be noted that the commonly used anti-IL-12 Abs recognize all presently known expression forms of p40: IL-12p75, IL-12p40, and IL-23. In accordance with the present study, IL-12p40 and IL-23 can be excluded to be crucial for infection with higher doses of Salmonella because there was no phenotypic difference at those infective doses between mice lacking IL-12p75 and mice lacking IL-12p40 and IL-23. In contrast to higher inocula, at relatively low bacterial infection doses between 50 and 5000 CFU an IL-12p40-dependent activity (i.e., IL-12p40 and/or IL-23) seems to contribute to the control of Salmonella infection, because survival rate and survival time were significantly higher and the bacterial burden in spleen and liver significantly lower in IL-12p35−/− compared with IL-12p40−/− mice. Because total organ burden and the frequency of infected phagocytes were elevated in the absence of IL-12p40 already at days 3 and 4 (Figs. 2⇑A and 4A), IL-12p40 appears to play a role already during the early innate immune response to activate macrophages or other phagocytes for Salmonella killing. The IL-12p40-dependent stimulatory effect on innate immunity can be observed for a wide range of infective doses of even up to 107 CFU (data not shown). However, at those high doses this early IL-12p40-dependent protective effect does not lead to long-term survival (see Fig. 1⇑) suggesting that at those high infective doses IL-12p75 plays a major role for long-term protection. It has still to be investigated whether IL-12p40 is able to stimulate the phagocytes directly or indirectly for secretion of other proinflammatory cytokines such as TNF-α or IFN-γ. Of particular interest within this frame appears the role of macrophage-derived IFN-γ, which was recently described in other systems (32, 33). Our data support the hypothesis that the IL-12p40-dependent activity is biologically relevant in immune responses toward low-dose infections (e.g., critical in persistent Salmonella infection) and that high-dose infections also require IL-12p75. The IL-12p40-dependent promoting activity on innate cellular immune mechanisms is not related to the Nramp1 genotype. Mice of both the resistant and the susceptible genetic background developed a Th2-biased immune response against S. Enteritidis in the absence of IL-12p40. This is in agreement with previously published data showing similar cytokine response profiles in Ityr and Itys congenic mouse strains following infection with S.Dublin (34). IL-12p75 has previously been shown to be the key factor for Th1 cell differentiation (10, 11, 12). Intracellular pathogens such as Salmonella induce predominantly type 1 immune responses, which include differentiation and activation of pathogen-specific Th1 and/or Tc1 cells (3). Therefore, type 1 response-inducing cytokines (e.g., IL-12p75) or effector cytokines (e.g., IFN-γ, TNF-α) are often crucial in intracellular infections. This was confirmed for IL-12 (30, 31), IFN-γ (29, 35, 36, 37, 38), and TNF-α (29, 37, 39, 40, 41) in murine salmonellosis. To study a potential promoting effect of IL-12p40 on the development of the S. Enteritidis-induced type 1 response we have analyzed the concentrations of IFN-γ and TNF-α vs IL-4 or IgE in splenocyte supernatants and sera. The results demonstrate a significant Th2 shift in S. Enteritidis-infected IL-12p40-deficient BALB/c and even more pronounced in 129Sv/Ev mice, characterized by higher in vivo IgE but lower in vivo and ex vivo IFN-γ levels. Thus, not only IL-12p75 contributes to Th1 induction during salmonellosis but also IL-12p40. This is in agreement with results from a murine CMV model showing that endogenous IL-12p40 in the absence of IL-12p75 appears to stimulate early IFN-γ and TNF-α responses (42). Histopathological analysis also provided evidence for early and late effects mediated by IL-12p40. At day 4 p.i. no mononuclear granulomas were formed in the absence of IL-12p40. This is reminiscent of our previously published finding in IL-12p40-deficient mice infected with C. neoformans (19). In infection with this fungal pathogen granuloma formation was found to depend on IL-12p40 (19). Moreover, homodimeric IL-12p40 was recently shown to exert chemotactic activity on macrophages in vitro (43). In S. Enteritidis infection later neutrophils appear to compensate for the defect in formation of mononuclear granulomas. 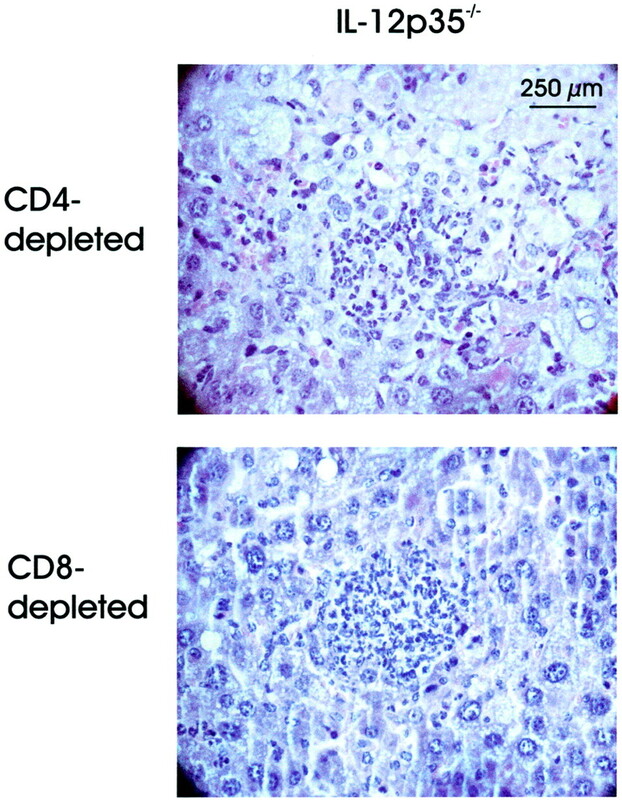 In addition, T cell depletion in infected IL-12p35−/− mice, especially the depletion of CD8+ T cells, leads to loss of structured mononuclear granulomas, which is followed by the appearance of condensed necrotic foci (see Fig. 9⇑) very similar to IL-12p40−/− mice (see Fig. 8⇑). This suggests that T cells are important sources for cytokines (e.g., TNF-α) required for the recruitment of mononuclear cells and granuloma formation. There are three derivatives of the “p40 cytokine family” described so far: 1) IL-12p75 (⇒ p40 + p35) (5, 6), 2) IL-12(p40)2 (13, 14, 15, 19), and 3) IL-23 (⇒ p40 + p19) (18). It was previously shown in vitro that mouse IL-12(p40)2 is 25- to 50-fold more potent as an IL-12p75 antagonist than mouse IL-12p40 monomer (14). Mice lacking the p35 gene are deficient in IL-12p75 production but are capable of producing (p40)2 and IL-23. In contrast, mice lacking the p40 gene are unable to produce IL-12p75, IL-12(p40)2, and IL-23. Thus, the results from this study do not allow a differentiation between IL-12p40- (monomer or homodimer) and IL-23-mediated functions. However, real-time RT-PCR measurement showed that neither in wild-type nor in IL-12p35−/− mice IL-23p19 is induced at the mRNA level, whereas IL-12p40 mRNA is strongly up-regulated in both wild-type and IL-12p35−/− mice at day 20 p.i. 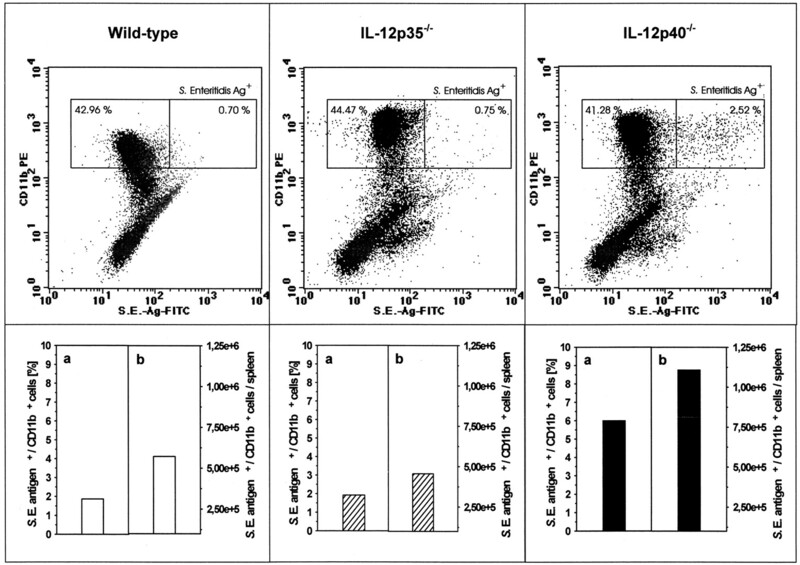 This points to IL-12p40 as the critical immunostimulatory cytokine and does not support an involvement of IL-23. Data from a murine transplantation model (20) and a murine paramyxoviral bronchitis model (44) also point to homodimeric IL-12p40 as the active compound. Considering these studies and the higher affinity of IL-12(p40)2 vs IL-12p40, it is likely that homodimeric IL-12p40 but not monomeric IL-12p40 is the active molecule that mediates the protective effects in Salmonella-infected IL-12p35−/− mice. To define the active p40-dependent compound experiments are planned to treat infected IL-12p35/40−/− mice with rIL-12(p40)2 and, for comparison, with rIL-23. The absence of detectable p19 mRNA expression as described above is not sufficient for final exclusion of a potential role of IL-23 in immunity to Salmonella infection. In further investigations we have to neutralize p19 or specifically IL-23 or use p19−/− mice to address the question more directly, whether the IL-12p40-dependent protective mechanism(s) on immunity against S. Enteritidis are mediated by IL-12(p40)2 or IL-23. We gratefully acknowledge R. Haack for excellent technical assistance. Furthermore, we thank Drs. H. Gallati (Hoffmann-LaRoche, Basel, Switzerland) and G. R. Adolf (Ernst Boehringer Institute, Vienna, Austria) for providing reagents, Dr. H. Mossmann (Max-Planck-Institute for Immunobiology, Freiburg, Germany) for providing the animal breeding pairs, and Drs. H.-J. Selbitz, S. Springer, and T. Lindner (Impfstoffwerk Dessau-Tornau, Rosslau, Germany) for providing the S. Enteritidis strains. We thank Dr. R. K. Straubinger for critically reading the manuscript. ↵1 This project was supported by Grant AL371/3-1 from the Deutsche Forschungsgemeinschaft. ↵2 Current address: Landesveterinär- und Lebensmitteluntersuchungsamt Sachsen- Anhalt, Stendal, Germany. ↵4 Abbreviations used in this paper: p.i., postinfection; hk S.E., heat-killed S. Enteritidis. Kruisbeek, A. M. 1991. In vivo depletion of CD4- and CD8-specific T cells. In Current Protocols in Immunology. J. E. Coligan, A. M. Kruisbeek, D. H. Margulies, E. M. Shevach, and W. Strober, eds. Wiley, New York, pp. 4.1.1–4.1.5. Comparative CT Method (Separate Tubes). 1997. PE Applied Biosystems. User Bulletin 2: ABI PRISM 7700 Sequence Detection System.